Approx. overall print size 23” x 31”/ 58cms. x 79cms. 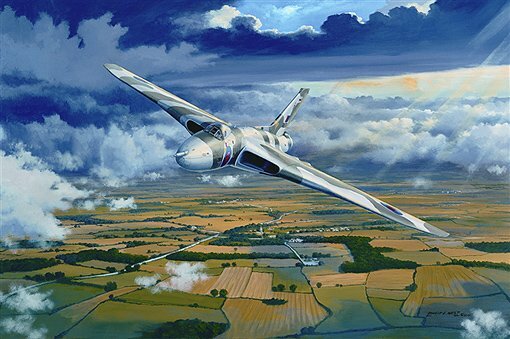 Moments after take off, the mighty Avro Vulcan bomber begins her majestic climb through storm clouds, our over the British countryside towards the North Sea. A masterpiece of British engineering 'excellence', she acted as a nuclear deterrent throughout the cold war until the arrival of Polaris. Prior to her retirement in 1993 she had thrilled many in air displays nationwide.